You will love this greens recipe. I have many fresh leafy greens like collards, mustard greens, beet greens at the end of the page. I have an awesome recipe for Southern Greens further down the page that you don't want to miss. Simple to make and so good. Regardless of variety, always look for crisp leaves with vibrant color. Yellowing is a sign of age and indicates that the greens may have an off flavor. 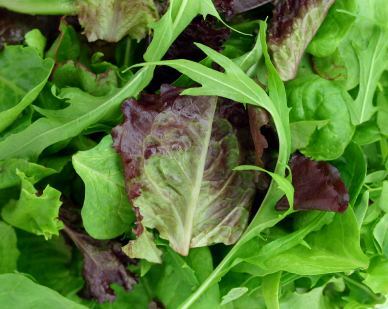 Young, leafy greens generally have small, tender leaves and a mild flavor. Many mature plants have tougher leaves and stronger flavors. Choose mild flavored greens such as collards, chard, bok choy or spinach when you want their flavor to blend well with other ingredients in your dish. For greens with a medium sharpness choose kale. For stronger, assertive flavors, select mustard greens, arugula, mizuna or turnip greens. To create a balanced dish when cooking a greens recipe, combine mild and strong flavored greens together. Collards, kale, turnip greens and mustard greens are at their best from October through early spring. Swiss chard and beet greens are best from the spring through the fall. Dandelion greens are available and best in the spring and summer. Just click on the item to find more greens recipes. Arugula: is peppery and has a delicate texture. You may use it in salads or sandwiches and it is versatile for cooking. Beet Greens: are mild, slightly sweet and very tender. You can steam, braise or saute them or even serve raw in a salad. Bok Choy: is sweet, mild and stays crisp when cooked. Bok choy is excellent in stir-fries, salads or soups. Broccoli Rabe: is tender, chewy, and robust in flavor. You can saute or braise it and it is a leafy green used in Italian dishes. Collard Greens: are mild, sweet and cooks down to a tender texture. You can steam, braise, or saute collard greens and it shrinks the least when cooking. Dandelion Greens: are pungent, spicy and bitter. You may eat small leaves raw and saute and braise the longer leaves. Endive (Chicory): is tender, bitter and high in fiber. You can eat it raw in salads. Cook it briefly for a milder flavor. Escarole: is course and mildly bitter. You may eat it raw in salads, steam it or add to homemade soups. Kale: is mildly peppery and tender. You can boil, steam or saute kale but the tough stems and ribs must be removed. Mizuna: is tender, spicy and has an exotic flavor. It is served raw or slightly wilted and mixed with other greens in a salad. Mustard Greens: have a subtle, hot mustard flavor. You also must remove the tough stems and ribs before cooking. Spinach: has a soft, sweet and rich flavor. It is the most commonly used green and you can eat it raw in salads and sandwiches, saute and braise it or add spinach to soups, quiches or pasta. Swiss Chard: is tender, sweet and has a velvety texture. It is a multi-purpose green an is either wilted, sauteed, braised, added to soups, casseroles and pasta. Red chard may dye other foods red. Turnip Greens: have a sharp and bitter flavor. Boil until silky for a traditional southern style dish. Most greens can be stored in the refrigerator for several days until you use them in recipes. Wrap collards or kale in a damp paper towel and place in an open plastic bag in the crisper drawer or in the coldest sections of your refrigerator until you use them in a leafy greens recipe. Store chard, escarole, chicory, broccoli rabe and mustard greens in a perforated plastic bag. Tender, delicate leaves such as beet greens wilt very quickly, so use them as soon as possible or purchase them on the day you plan to prepare them. Greens with similar texture can be used interchangeable in recipes, though they will impart slightly different flavors. One pound of fresh, untrimmed greens will typically serve two to three people. While this may look like a lot when raw, a significant portion of the plant (stems and ribs) will be discarded and most greens shrink considerably when cooked. So remember this when cooking a greens recipe. To prepare greens for washing, cut off the stems and discard any bruised leaves. For greens with tough stems, (such as collards, mustard and kale) cut off the stem backbone, which can be quite tough. Chard, bok choy, turnip and beet greens have tender stems that can be eaten along with the leaves. Wash the greens and edible stems in a sink full of water to remove dirt and sand. Bunches of greens that are especially sandy may require several soakings. Curls and grooves on the leaves can hide bits of sand, so be thorough even if the greens look clean. Drain the greens in a colander and chop or slice them according to recipe directions. Greens provide a wide array of nutrients including fiber, beta-carotene, calcium, iron, folic acid and chlorophyll (which is the green pigment in plant cells). Many varieties of leafy greens, especially members of the cabbage family such as collards, kale and bok choy are also sources of vitamin C.
Awesome and traditional greens recipe. Tear greens into pieces and discard the thick vein. Add greens to a pot of salted boiling water and cook for 6 minutes. Drain. While the greens are cooking, preheat olive oil over medium high heat and add the onion and garlic. Saute until the onions are lightly brown. Add the minced jalapeno pepper and cook for another minute or two. Place the sauteed onion in a crock pot and then add the remaining ingredients. Cook on high for 4 hours or until the greens are tender. Serve with balsamic vinegar if desired. This is very good with corn bread. If you are interested in other vegetables instead of all greens recipes, please click on any of these links below, or at the top of the page. Enjoy.